The Internet has certainly made life a lot easier. There were so many aspects which needed a person to move about and get things done like shopping, banking, applying for jobs and so on, but now internet has made life simple, with providing access to just about everything with a click of your fingers and a tap of a few buttons. Everything good must be used in moderation but ‘Internet Addiction’ is a rising concern amongst people. Being addicted to the internet and social media, unfortunately has more disadvantages than advantages. Sleep deprivation – Internet and Smartphone Addiction is one of the major causes of sleep deprivation. Decreased time management skills – Once you start browsing for whatsoever reason it may be, one finds it difficult to stop. Increased risk of mental disorders – People who spend more time on internet are found to have increased risk of mental disorders like anxiety, depression, irritability, etc. Increased risk of instant gratification – Getting instant replies makes people less sensitive and give rise to increased expectations. Anything invented or created by mankind has equal number of good and bad effects. It is up to us, to take the good and leave the bad behind. 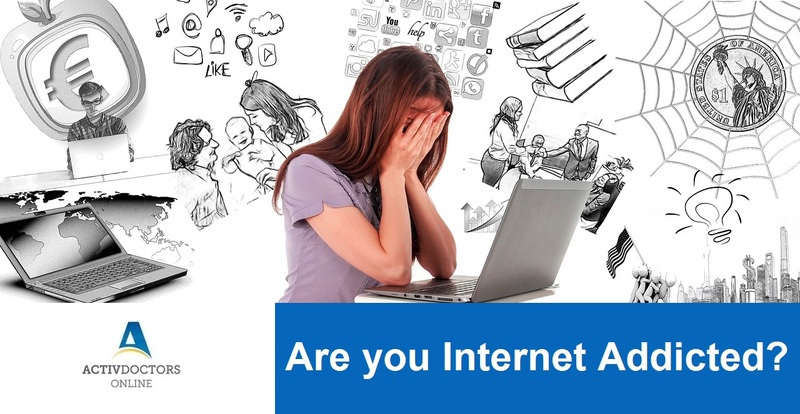 Internet Addiction is real – evaluate your habits, be more than well. COPYRIGHT © 2015 ACTIV DOCTORS CONSULT, LLC. ALL RIGHTS RESERVED.